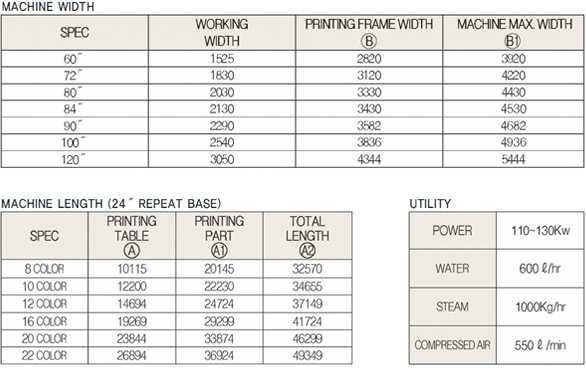 The inexpensive and high efficiency printing machine has durable structure to maintain it at low cost. 1) Drive in synchronized way with 2 servos of printing squeegee. 2) High speed by squeegee angle conversion. 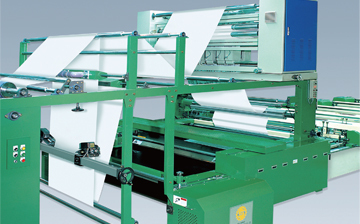 3) Print all kinds of cloth owing to various kinds of machine specifications. 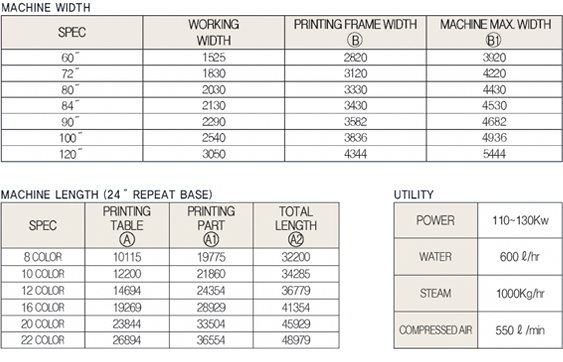 2) Run dancer R/O, expand and centering guide separately to be suitable to print all kinds of clothes. 1) Heating R/O with supply of steam moves horizontally and continuously at top of the blanket to supply cloth and adhere cloth to the blanket. 2) Print flexible cloth better than dancer type does. 1) By driving with high quality timing belt, we removed most of noises and achieved low maintenance cost. 2) This system removed the noise and micro-dust resulting from angle change system of old model. By adopting 1) AC servo motor with advantages of high speed -responsiveness-precise control and 2) Special worm reducer minimizing backrush we have achieved almost perfect repeat accuracy. 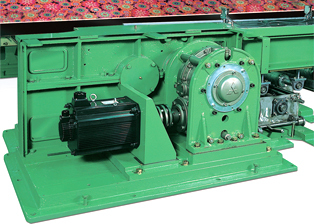 1) AC servo from YASAKAWA has higher level of precise control. 2) Good knowhow assures of precision. 1) Washing system consist of brush, shower, pipe, rubber docto.r Washing system is to clean dirts on the blanket. 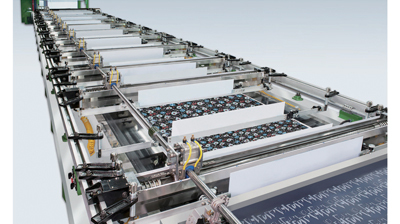 2) Mangle system is driven synchronized with blanket automatically. This is to prevent damage on the blanket surface and roller mark when machine stops running. We adopted servo system on this part of machine to remove noise and to achieve higher productivity. 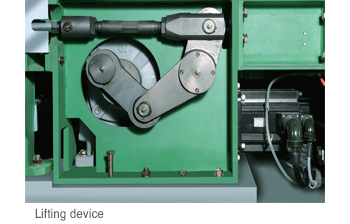 This system is superior to the old hydraulic system in many ways. 1) Significantly silent compared to hydraulic system. 2) No maintenance such as“oil change”and“leakage repair”. 3) Higher productivity and quality. Control panel was designed for the easy and consistent control of machine with minimal break down. For this effect we adopted most reliable parts from world renowned manufacturers. 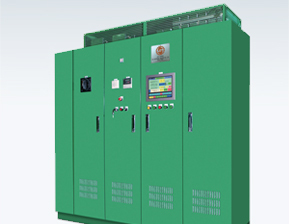 1) By applying “motion control” on lifting system, we achieve precise control with machine operation. We also composed the control panel with parts that can be resourced from after market so that the client can maintain the machine efficiently. 2) Touch screen controls whole system making operation and maintenance easy.